Pigeons... if you live in a big city, you know what I'm talking about. Looking at the sky with fear, trying to avoid the nasty bird excrement. Now it's your turn to splotch pedestrians with poo. 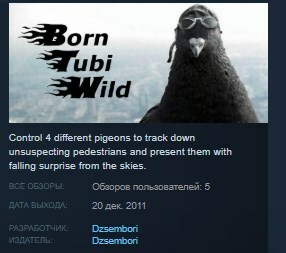 In this game, you can be one of four different pigeons and fly to six different locations to keep people in terror. Find breadcrumbs to keep those droppings coming. - Tipsy: alcohol soaked breadcrumbs made you dizzy. Unlock all locations and never forget to eat seeds (as a pastime activity).